Europe is known for its beautiful architecture and rich history. And one of the most glaring examples of both comes in the form of churches. Europe is full of gorgeous churches of every shape and style imaginable. This is the premise behind our blog mini-series “Famous Churches of Europe.” Each blog in the series will highlight the most famous – and stunningly beautiful – churches of a certain city. This week’s focus: Florence, Italy. Florence, like so many cities in Europe, is home to more than a few beautiful churches. And because Florence was the cradle of the Renaissance, many of these churches are decorated with magnificent works of art. The Gothic-style basilica was begun in 1296 by Arnolfo di Cambio and completed in 1436 with the dome engineered by Filippo Brunelleschi. The exterior of the basilica is faced with marble panels in various shades of pink and green bordered by white and features a 19th-century Gothic Revival façade by Emilio De Fabris. The Basilica di Santa Maria del Fiore is one of Italy’s largest churches and until recently was the largest dome in the world. What’s even more impressive is that the dome was completed without the use of scaffolding. Wow! And if you want to experience the inside of the dome and enjoy the extraordinary view of Florence, all you have to do is climb the 463 steps. There is no elevator. Located in the Piazza del Duomo, the basilica, along with the Baptistery and Giotto’s Campanile, are part of the UNESCO World Heritage Site. This early-Dominican basilica was built between 1246 and 1300 by Jacopo Talenti before being rebuilt in the Gothic (Outside)-Romanesque (Inside) style towards the end of the thirteenth century. The church features a beautiful green and white marble façade, and houses such masterpieces as the Trinity by Masaccio, the crucifixes by Giotto and Brunelleschi and, Renaissance frescoes by Ghirlandaio and Filippino Lippi. 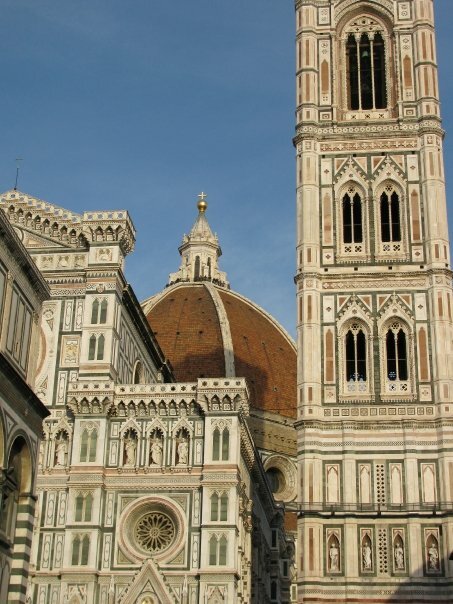 Of course, these are just a few examples of the many beautiful churches found throughout the city of Florence. To experience to full wonder, you will need to visit the city yourself. There’s nothing quite like it. Officially called the Orthodox Russian church of the Nativity of Christ and Saint Nicholas in Florence, the church was built be the Russian community and the talented Russian architect Michail Préobraženskij between 1899 and 1903.The church features five onion-shaped domes and houses tall figures of Orthodox saints that stand among the colored mural paintings and byzantine icons. It is possible to visit the church by appointment. 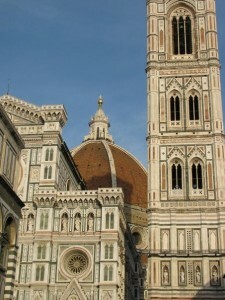 AESU offers several trips to Florence: Euro Focus, Great Escape, and Viva Italia. Want help booking one of our Affordable Trips to Florence, Italy? Please contact AESU by calling 800-638-7640 or fill out the contact form found on our website. And don’t forget to check out all of our great Travel Tips, especially the Travel Tips for Europe, before you head overseas. This entry was posted on Thursday, January 22nd, 2015	at 8:08 pm	. You can follow any responses to this entry through the RSS 2.0	feed. Both comments and pings are currently closed.